TORONTO -- A back-to-work bill that would end a strike by college faculty in Ontario appears on track to be pushed through the legislature on Sunday. The bill cleared another hurdle on Saturday while the Liberals and New Democrats pointed fingers at each other over how the legislation has been handled. 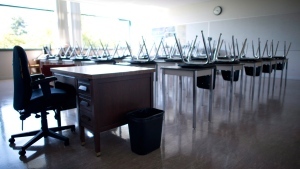 The New Democrats have blocked swift passage of the bill since Thursday and Advanced Education Minister Deb Matthews said the NDP was unnecessarily delaying students' return to the classroom. "It's very distressing to see the NDP be so disrespectful of students that they won't even pass the legislation, that they're... blocking the return to classes," Matthews told reporters after Saturday's legislative session. The accusation drew a sharp response from NDP Leader Andrea Horwath who said Matthews was being irresponsible. "For a cabinet minister, a minister of Crown, to suggest that any legislator should pass through legislation without even reading it, that is the height of irresponsibility and shameful," Horwath told reporters on Saturday. "I am disgusted frankly, by the tactics that that minister is using, it is inappropriate." Both sides in the debate expect the bill will be passed on Sunday and if that occurs, hundreds of thousands of students could be back in class by Tuesday. Ontario Public Service Employees Union President Warren (Smokey) Thomas said the union tried to get the colleges' bargaining team back to the table. But Don Sinclair, CEO of the College Employer Council, said his team didn't get the message. 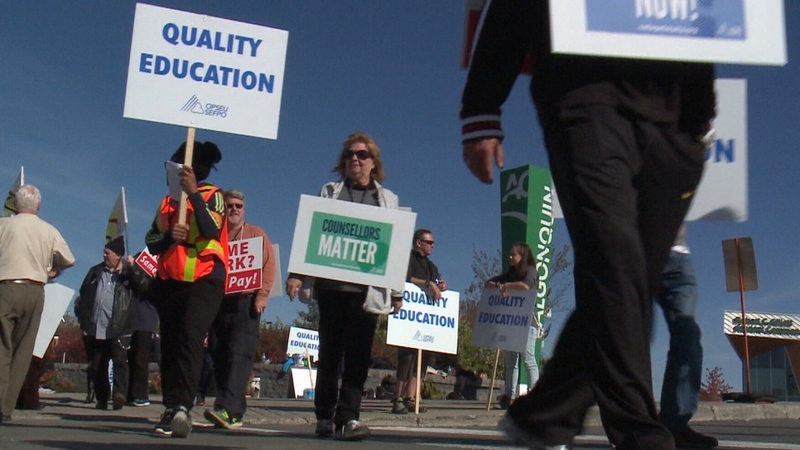 "The colleges' bargaining team has not received any request from the provincially appointed mediator about bargaining this weekend," he said in a written statement. The 12,000 professors, instructors, counsellors, and librarians went on strike Oct. 15. The legislature will sit both today and Sunday, and if the bill gets passed this weekend hundreds of thousands of students could be back in class by Tuesday.